One of the best known board games in the world is Scrabble. There have been more than 150 million copies of this game sold throughout the world. It has been used for years by many countries to help students to learn English. 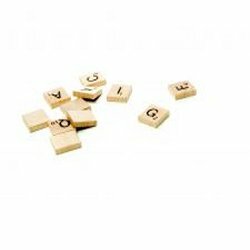 Scrabble has not only been made available in countless countries, it is available in many different formats. There are travel versions, computer versions and even Braille versions of this fun word game. Scrabble is played on a square board with 15 spaces across and 15 down, there are 225 squares on the board. When the game was first played you did not use a board, you only had the tiles. The highest known score for a single word is 392. The word used by Dr. Saladin Khoshnaw in 1982. The word was craziques which means Indian Chief. There are 100 tiles in the original game. If however, you are playing the game in either Portuguese or Italian there are 120 tiles. Scrabble is sold in 121 countries. It is played in 30 different languages. Scrabble cannot be played in either Chinese or Japanese. Players from these courtiers use English tiles but have a dictionary in their own language. The game is also available in Braille. The youngest person to ever win a national scrabble title was Allan Saldanha. He won his title in 1993 in the UK, when he was just 15. If you are able to empty your rack in one turn you get fifty bonus points. In Canada and the United States this is called a Bingo. In other parts of the world it is called a bonus. In 1989, Phillip Appleby got the highest score on record. He finished the game with an amazing score of 1049 points. The world Scrabble Championships are held every two years. The world championship was won by Pakorn Nemitrmansuk from Thailand in 2009. The tournament was held in Johor Bahur, Malaysia. The first world championship was held in 1991 in London, England. The winner was Peter Morris from the USA. There were 48 competitors. The allowable words used at the world championships come from SOWPODS. Sowpods is an acronym for a combination of dictionaries which include the Collins English Dictionary, Collins Corpus, Merriam-Webster dictionary and four others. Alfred Butts was the creator of Scrabble. Alfred Butts was born in 1899 and died in 1993. Butts called his game Lexiko. He then renamed it Criss Cross Words. He sold the rights to the game to James Brunot, whothen changed the name to Scrabble. Alfred admitted that he is not a very good player. The word Scrabble when used as a verb means to scratch or dig. It the word is used as a noun it means, a scrawled writing, or a scramble. An elder resident in the UK was thrown out of her retirement home when she admitted that she did not play Scrabble. Ganesh Asirvatham holds the record for playing the most scrabble games simultaneously. He played 25 games at the same time and won 21 of them. This entry was posted in Game & Hobby Trivia and tagged Scrabble Facts, Scrabble Game, Scrabble Game Trivia, Scrabble information, Scrabble trivia, Scrabble Trivia Facts by Jane. Bookmark the permalink.